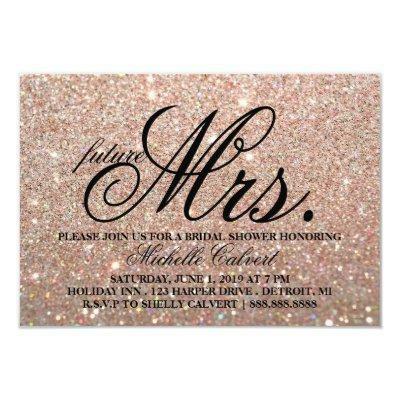 Invite - Rose Gold Glit Bridal Shower future Mrs.
Modern Glitter Bridal Shower Invite. Easily customizable using the customize it button, change background color, image, text color, text size, text spacing, to suit your occasion. Shown in size x 5, using the customize it button change your invite to any size desired. *Designer suggests glossy paper types for this invite. Invite is light blue.